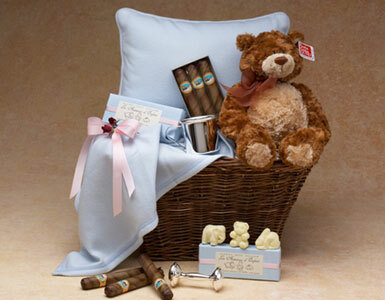 The Large Baby Basket is comprised of polar fleece blanket and pillow set (available in pink, blue or yellow), an antique style Gund teddy bear, a set of 3 French-milled baby soaps in animal designs, a silver-plated baby rattle and drinking cup and a set of chocolate cigars to welcome the new baby. We offer baby gift baskets, baby girl gift baskets, newborn gift sets, baby boy gift baskets, and baby gift sets. We promptly deliver your baby girl gift or baby boy gift to your home or office in Beverly Hills, West Hollywood, Santa Monica and greater Los Angeles area.